Update: Microsoft is now rolling out Windows 10 PC build 15042 and Mobile build 15043 for Fast Ring insiders. Check out what’s new in these Insider builds. Prompt to enable Flash in Microsoft Edge (PC): Back in Build 15002, we introduced click-to-run Flash by default in Microsoft Edge, for better security and performance across the Web. In today’s build, we’ve added a new dialog in the URL bar to make it clearer when Flash content has been blocked. Just click the puzzle icon to allow Flash once or every time you return to the same site. When reading a locally saved EPUB book in Microsoft Edge on PC, a book icon will now be used in the place of the previous generic in the tab bar. If you switch pages while an EPUB book is being read aloud in Microsoft Edge, the reader will now jump to that new location in the book. If you’ve changed the read aloud settings when reading an EPUB in Microsoft Edge, those settings will now be preserved for subsequently opened books. ou should no longer see “Initializing…” when attempting to download new builds. The download progress indicator shown when downloading new builds under Settings > Update & security > Windows Update should be working as expected and it should no longer appear you are getting stuck at 0% or at other percentages. We fixed the issue causing the Settings app to crash when navigating to Settings > Devices and you should be able to pair a Bluetooth device without any issue. The Bluetooth quick action from Action Center should also now work again. This issue may also have resulted in generally decreased reliability in the quick action section of the Action Center. You should be able to launch the Connect UX via Action Center, Win + K, or Settings again. We fixed an issue where under Settings > Update & security > Windows Update Insiders might see the text “Some Settings are managed by your organization” even though the PC wasn’t being managed by an organization. We fixed an issue resulting in the Action Center sometimes appearing blank and transparent without color. We fixed an issue where upgrading with an Xbox controller paired over Bluetooth could result in touch input not working and unexpected beeps when using the mouse. We fixed an issue where items displayed in the autocomplete dropdown when filling form fields in Microsoft Edge would not insert when clicked. We fixed an issue resulting in images unexpectedly being missing from certain PDFs when viewed in Microsoft Edge. We fixed an issue resulting in web notifications not launching the associated website in Microsoft Edge after being clicked. We fixed an issue from recent flights resulting in some downloads from Microsoft Edge unexpectedly getting stuck in the “Waiting to download” state. We fixed an issue where the calculator button on the keyboard wouldn’t work if Microsoft Edge was in focus. We also fixed an issue where Win + Shift + left/right arrow wouldn’t work on Microsoft Edge after selecting text on the open website. We fixed an issue where pressing Alt + C with text selected in Microsoft Edge didn’t open the Cortana pane on recent flights. We fixed an issue resulting in Microsoft Edge not being able to open the file:// protocol with the AdBlock Plus extension enabled. We fixed an issue where in Microsoft Edge, if you were already on a website associated with an app, clicking a link on that website to go somewhere else on the website’s domain would unexpectedly launch the associated app. We fixed an issue resulting in not being able to insert words into certain text fields in Microsoft Edge when using the handwriting panel to enter text. We fixed an issue resulting in the password placeholder text being unexpectedly shifted down in certain password text fields in Microsoft Edge. The new Share icon is now visible in Microsoft Edge and the Windows Ink Workspace Sketchpad and Screen Sketch. We fixed an issue we certain devices on recent builds where resuming from hibernation could result in a bug check. We fixed an issue where sometimes a single notification toast might not pop up, only to be unexpectedly found duplicated in the Action Center. We broadened our recent fix for an issue that had some PCs with older graphics chipsets seeing white or colored boxes in the place of text and some UI elements in UWP apps to cover more hardware. If you right-click an app suggestion in Share, you’ll now find a context menu option to turn them off. We fixed an issue where ink would go under the Windows Ink protractor when inking with the highlighter. We fixed an issue where the first ink stroke into the Windows Ink Workspace Sketchpad wouldn’t enable the clear all button. We fixed an issue where the sample ink stroke seen in the Windows Ink pen, pencil and highlighter flyout would appear to blink when the flyout was first opened. We fixed an issue that could result in the new XAML scrollbar animation (as seen in Settings) becoming stuck in the transition state. We fixed an issue resulting in “Microsoft Camera Front” and “Microsoft Camera Rear” unexpectedly showing up, with barcode scanner icons, as optional devices to connect to in Devices Settings on Surface Books. We fixed an issue where explorer.exe might crash the first time an ISO file is double-clicked. We fixed an issue from the last flight where if the gateway host name was of the form [ipv6address]::port, Remote Desktop couldn’t connect to the gateway. We fixed an issue where the bug check screen on high resolution displays wasn’t rendering the “Frowny” part of the frowny face. We fixed an issue where night light might not turn on/off automatically if the device was asleep at the time at which the night light state was scheduled to change. The night light on/off animation’s duration has been increased to 2 minutes – appreciate everyone who’s shared feedback for this feature, keep it coming! Microsoft Edge’s “Inspect Element” and “View Source” options should launch correctly to the DOM Explorer and Debugger, respectively. We fixed the issue causing the Settings app to crash when navigating to Settings > Devices and you should be able to pair a Bluetooth device without any issue. The Bluetooth quick action from Action Center should also now work again. This issue could have also resulted in decreased Flashlight quick action reliability. Using Continuum to connect to a display wirelessly should also work as expected. We fixed an issue resulting in screen rotation sometimes unexpectedly not working on the last Insider flight. We fixed an issue where live tiles were not updating some apps such as Outlook Mail and Calendar. We fixed an issue where under Settings > Update & security > Phone update Insiders might see the text “Some Settings are managed by your organization” even though the phone wasn’t being managed by an organization. We fixed an issue where tapping the link for a website with an associated app would crash Microsoft Edge and not open the associated app. We fixed an issue where downloads from Microsoft Edge directly to an SD card might unexpectedly use space on the local phone storage as well. We fixed an issue where the keyboard might dismiss after a second when opening a new tab in Microsoft Edge and quickly starting to type. We’ve fixed an issue that could result in your personal typing dictionary being unexpectedly deleted and having to train the keyboard from scratch. We fixed an issue where, during the download of a phone update, after disconnecting then reconnecting to Wi-Fi due to low reception you might get an error saying the download needs a better connection to continue, despite currently being connected to a good Wi-Fi connection. We’ve improved the video playback experience when using Continuum for phone wirelessly over Miracast. • Adding a new card / paying with an existing card will not work in Microsoft Wallet. • The icon for Windows Insider Program under Settings > Update & security is shown as a square. 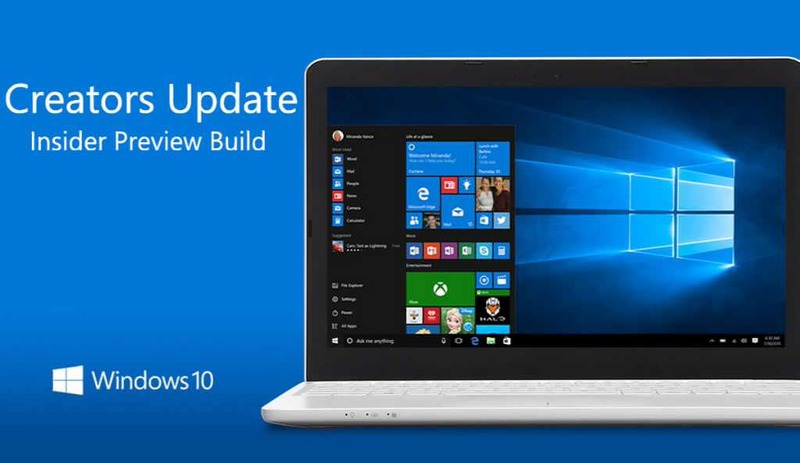 Original Story: Windows 10 build 15043 for PC and mobile build 10.0.15043.1000 is now under testing. The new Windows 10 Creators Update Insider build 15043 was compiled on February 21, 2017. Also, Microsoft is now testing first Redstone 3 update build 15141. The next major updates Redstone 3 and Redstone 4 will come later this year and next year respectively. Recently, Microsoft canceled Windows 10 February update because of ‘last minute issue’. There are reports that the company was having problems with its patch build system, and that those problems resulted in the company’s failure to deliver its regular Tuesday patches. Windows 10 build 15043 for PC and mobile may release for Fast ring members this Friday.